1. A machine which makes copies of printed or graphic matter. 2. 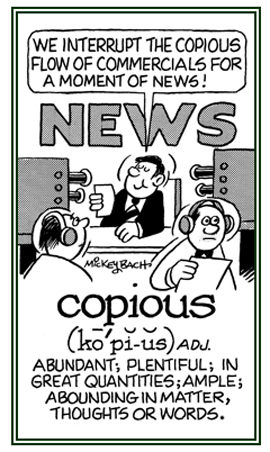 Someone who transcribes or copies; such as, a copier of ancient manuscripts. 3. A device which makes copies of something; such as, software or recordings. 1. An abundance or an overflowing supply. 2. Having plenty or a large quantity. 3. 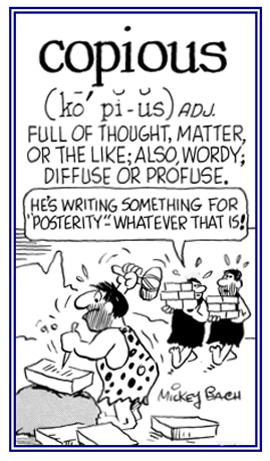 Abounding in matter, thoughts, or words. 1. In an abundant manner. 2. A reference to being large in quantity or number; abundant; plentiful. 1. Having the characteristics of a more than adequate quantity or supply. 2. The state or quality of being copious; abundance; plentifulness; also, diffuseness in style, or manner, of treating a subject or topic. 1. Something which is made exactly like something else in appearance or function. 2. One of many identical specimens of something produced in large numbers; especially, something printed or published. 3. The written text to be published in a book, newspaper, or magazine, as distinct from visual material or graphics. 4. To do exactly what someone else does; to reproduce the work of another person. 5. Suitable source material for journalism: "As a movie star, she was good copy for journalists." 6. Etymology: from Latin copia, "plenty, abundance"; then from French copier from Middle Latin copiare, "to transcribe, to write in plenty"; and later came the particular meaning, "to write the original text many times". Anything which is done in close imitation of another person or of something else. 1. A type of ownership of land in England, evidenced by a copy of the manor roll establishing the title. 2. A medieval form of land tenure in England. A copyhold was a parcel of land granted to a peasant by the lord of the manor in return for agricultural services. 1. A document granting exclusive right to publish and sell literary, musical, or artistic works. 2. The legal right of creative artists or publishers to control the use and reproduction of their original works. Inter-related cross references, directly or indirectly, involving word units meaning "more, plentiful, fullness, excessive, over flowing": exuber-; hyper-; multi-; opulen-; ple-; pleio-; plethor-; poly-; super-; total-; ultra-; undu-.